To my best of knowledge most people want to expand their poultry farm, because he/she have an egg to hatch and achieve his or her dream. Some people think that one way to do this, is by purchasing new chicks from local store. Hatching eggs on your own. If you have never considered hatching your own eggs I encourage you to educate yourself on how to do this and try it because it really isn’t hard and it will save you a lot of time and money. Plus, raising chicks that you hatched by yourself brings a different feeling of satisfaction. When I first decided to hatch my own eggs it was during an emergency situation with our flock, and I had no idea what I was doing. It was stressful, to say the least. Don’t wait until you are in a situation where you have to hatch your own eggs. Learn how now, and you never know. You just might fall in love with the whole process. Buying a solid incubator is vital in the process of hatching chicken eggs. The reason is because you need to maintain a constant temperature and humidity level to have any success in hatching your own eggs. Price: In most instances, you get what you pay for. So you don’t want to go over and above on the purchase price, but don’t be disappointed in quality if you buy a cheaper one. Finding an incubator that is middle of the road with good reviews is probably a good choice. Manual or Automatic Controls: This is referring to an egg turner. Obviously having an automatic egg turner will take pressure off of you during the process. But we will talk more about turning eggs in a bit. Forced or Still Air: You will want forced air because it usually means that the air is distributed equally. Ease Of Cleaning: When eggs hatch they make a mess. And if your incubator is not cleaned well, it is literally a perfect place to incubate disease as well. So choosing an incubator that is easy to clean will be a tremendous gift to yourself after your first hatching experience. If you are feeling extra ambitious and confident then, by all means, build your own incubator. But if you are still a little skeptical then I would recommend going ahead and buying an incubator to simplify the process some. So after you purchase your incubator, you will need to set the temperature to 99.5 degrees Fahrenheit. Then you’ll need to set your humidity to 40-50% for the first 18 days and 65-75% for the final days. Now, it is important to mention that if your temperature rises by one degree or lowers by one degree that is enough to end an embryo’s life. 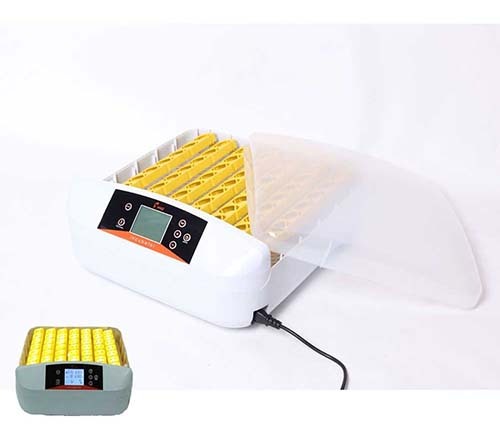 You will need to give your incubator around 24 hours to get up to temperature and humidity level so it will be able to begin the incubating process for your eggs. I’ll be honest, during my first time trying to hatch eggs, I fell flat because of this vital step. I just didn’t give my incubator enough time to warm up and lost a bunch of eggs in the process. As you can tell, having the right incubator and allowing that incubator time to get adjusted so it can function at its optimum temperature is vital in the hatching process. If you have a rooster in with your flock, it is a safe assumption that most of your hens’ eggs will be fertile. Begin by choosing eggs that are clean, not misshaped, and those that are a good size too. Choose fresh eggs that were laid that day if possible. In the incubating process, you can tell if the embryo is growing by holding a candle up to the egg. You should then be able to literally see growth within the egg. First of all, it’s important to know that you shouldn’t clean the eggs when you pull them from your hen’s clutch. The reason is because there is a coating that is naturally placed on the egg that is meant to protect the embryo. If removed, your embryo will not survive. As I’ve mentioned above, fresh eggs are better. But, if for some reason you are not ready to incubate your eggs, they can be placed in an egg carton and stored between 50-60 degrees Fahrenheit for up to 10 days. Store your eggs with the fat side of the egg pointed up. When you are ready to place your eggs in the incubator, keep them there for 21 days. You have to check the temperature and humidity regularly. By saying regularly, I mean, check it like a life depends upon it because, in reality, it does. If by some chance the humidity is too high or low, use a damp sponge of differing sizes. Depending on if you need more or less humidity. You may also have to add more water to the incubator over the first 18 days. When you reach day 18 you will definitely want to add water to the incubator to raise the humidity level. 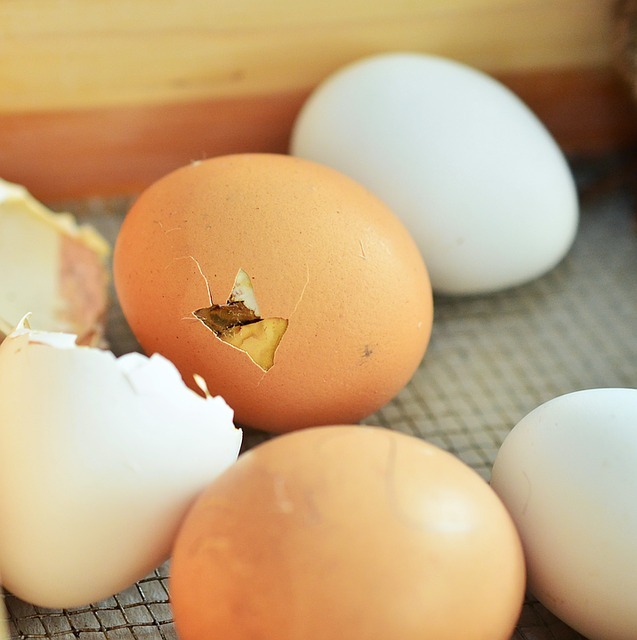 You can purchase an incubator that turns your eggs for you, but if you choose to turn them manually you will need to mark each side with an X and an O. This will help you keep track of which eggs have been turned and which have not. Turn the eggs at least 3 times each day, if not more. If you do turn the eggs more than 3 times be sure it is an odd number of times so the embryo does not rest on the same side of the egg for 2 nights in a row. Continue to turn your eggs until day 18. If this sounds like too much work for you then you can always purchase an egg turner too. After the first 18 days, you will leave the eggs alone to hatch. By day 18, you will probably begin to see the eggs moving on their own. This is because the chick has formed and is beginning the hatching process. Leave them be. The chick will begin to peck a small hole through the larger end of the egg. When they do this, the chick will take its first breath. Then the chick will rest from anywhere from six to twelve hours. This allows their lungs to adjust to breathing air outside of the egg. Some people think something might have gone wrong with their chicks. However, you can do nothing to help the hatching process along as the birds are very fragile in this state. You don’t want to cause injury. After the six to twelve hour resting period, the chick will finish out the hatching process. Let the chick be and dry inside the incubator. Once they are completely dry, you can transition them to a brooder box where they will live until they are ready to get out on their own. 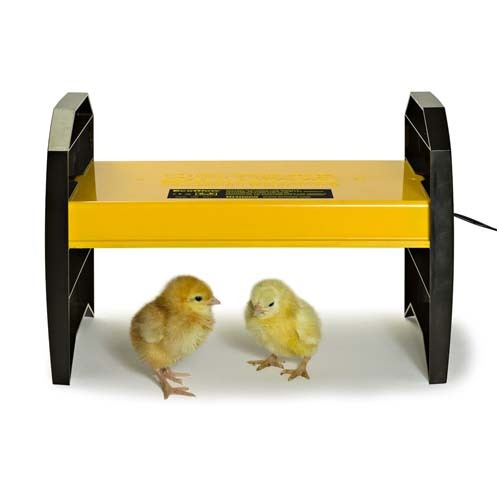 Once your chicks have been moved to their brooder box you need to be sure that they have a heat lamp on them for warmth. Set the brooder’s temperature based on your chick’s age, start with 95ºF on the first week then decrease 5 degrees per week until they are full-feathered (usually week 6-8). Then you need to supply them with chick starter feed and water. At six weeks old, you can slowly begin to introduce the chicks to the rest of the flock. At six weeks old, you can slowly begin to introduce the chicks to the rest of the flock. As an example of how we do this, we move our chicks to a tractor. This allows them to get acclimated with the other chickens but still be protected from the endless pecking that takes places with the pecking order. That’s all you need to know about hatching chicken eggs. There’s one more way to do it: without an incubator. If you don’t want to purchase an incubator and a brooder, you might want to try this method. She will be the one that is hanging out in the nesting box. But not all breeds of chickens will go broody. The best broody breeds are Silkies and Cochins. So if you would prefer to hatch eggs the natural way then you should keep the breed in mind when buying your chickens. Another way of identifying a broody chicken is that she will most likely become more aggressive. When you go to collect eggs she will peck and growl at you. And often times, she will become more aggressive towards the rest of the flock. Also, you can tell when a hen is going broody because she will only get up a couple of times a day to eat, drink, and go to the bathroom. So if you begin to notice your hen is excreting larger than normal amounts at once don’t panic. She is probably just going broody. The first option is you can allow her to sit right where she is at. Broody hens usually nest in the favorite nesting box. The problem is, other hens might lay eggs under her or get inside the nest and move eggs around which could consequently bust them. But the upside is you don’t have to move her or worry about providing separate necessities for her. You should also be aware that after her eggs hatch, she will leave newer eggs to care for her chicks once they hatch. Therefore, leaving a bunch of half-cooked eggs to rot. So you might have to step in and incubate those eggs with an incubator at that point. Try to mark the newer eggs if possible. The second option is to move her to another box. Be prepared to get pecked when you do this. It is probably best to move her at night, and you’ll want to have her nest, food, and water already set up so you can simply pick her up and put her back on her eggs where she will be happy again. This step is really easy on you because she does all of the work. She will continue to set on these eggs, keep them warm, and move them as frequently as they need to be moved. Once they have hatched she will care for her eggs too. Are you going to keep her separate from the flock to raise them? Or are you going to allow her to raise them with the flock? The upside to allowing her to raise the chicks with the flock is that the broody hen is allowed to interact with the flock as usual. This allows the chicks to be integrated a little easier as well. But the downside to this is that the chicks are less protected from predators. And because chicks can only eat starter feed, this means the whole flock has to go with starter feed. That can become very expensive, very quickly. However, if you decide to keep the mother hen and her chicks separate, they miss out on interacting with the rest of the flock. But the chicks are better protected from predators. And you have to feed less birds starter feed which is much easier on your wallet. Well, there you have it folks. That’s how you hatch chicken eggs naturally or with an incubator.